Let’s say this right up front: The SPDR Gold Shares Trust exchange-traded fund has killed the shares of the gold miners. For a few years now, I have been very skeptical about gold’s value as an investment (this may seem excessive, but see this, this, this, this,this, this, this, this, this, this and of course this). The primary reason for this is straightforward: Gold is bought and sold based on a narrative that has turned out to be patently untrue. As we move further away from the great credit crisis of 2008-09, the global financial system has stabilized, undercutting the appeal of gold as a hedge against catastrophe. The U.S. economy is improving, as are those of many other countries. The wild inflation and collapse of the U.S. dollar that was going to lead to the demise of civilization and make gold an essential for investors? None of that has happened. Instead the world has low inflation or even deflation and the dollar, the world’s reserve currency, has risen to multiyear highs. Unlike the metal, which is formed in the supernovae of second generation stars, the rationale for gold ownership isn’t eternal. It ebbs and flows along with a variety of inputs, including the strength of the dollar, inflation and, of course, mass psychology. Last week, rather than discuss the metal, I asked the question “Are Shares of Gold Miners a ‘Buy’?” But today’s missive is about something more nuanced than gold — I want to address the question of the divergence between gold and the gold miners. It is a intriguing issue. As I noted, Isaac Arnsdorf at Bloomberg News offered up this fascinating chart of the price ratio between gold and the gold miners. 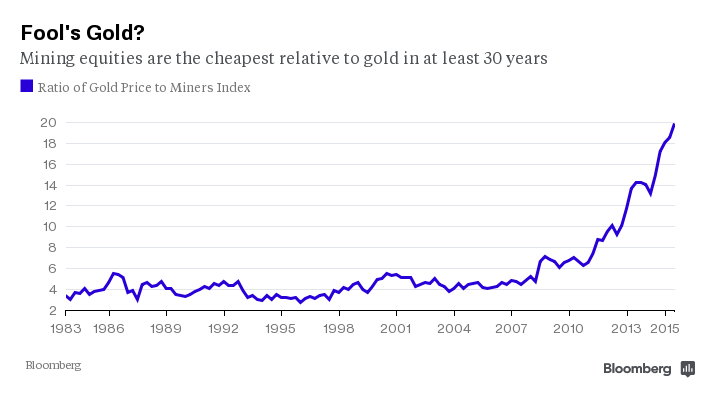 It shows that the miners are the cheapest relative to gold in more than three decades. I believe it is worthy of further exploration — especially for those folks who are tempted to buy any of the miners now that they seem to be bargains. What might lead to a return to the historical relationship between gold and gold miners has yet to be determined, but I caution readers that there is cheap, and then there is really cheap. There may be some point where the miners are a good buy relative to the price of gold. But determining when that is has been complicated by a serious breakdown of the gold/gold-miners ratio. The key word here is “proxy.” Gold miners were once a fair proxy for physical bullion. If it were impractical for you as a fund manager to own bars of gold, which entails transportation, storage and security, you had an easy alternative. You bought shares of the miners. The (theoretical) gold reserves they owned was a component of their book value, and was an indirect way to own gold with none of the other costs. Similarly, if you were an individual investor, and you didn’t want to play the futures markets — high leverage and risk of losses beyond your original investment — you also could buy shares of the various miners. Then in 2004 along came the SPDR Gold Shares Trust ETF, which gave both the professional money manager and the individual investor a fast, cheap and easy way to invest in gold. The ETF killed the primary reason for owning gold miners. Why bother investing in a company saddled with the overhead cost of running a mine and error-prone management — all a drag on returns — when you could instantly buy a stake in gold without any of the complications? The Council succeeded too well: Their creation eroded the need for investors to bother with the shares of the miners themselves. As I said earlier, there may be some price at which the gold miners become attractive. But it seems like it will be impossible to undo the fact that the reason for owning the miners has been displaced by a less expensive, more efficient investment vehicle for gold. In that case, good luck figuring out at what price the miners are actually cheap. I agree with you that gold is generally a pretty terrible investment. That said, the miners have been absolutely massacred in the last two months, and despite not liking the sector that sets my value and contrarian bones a-shakin’. Current spot gold is below the all-in-sustaining-costs (AISC) of many mines, and that’s before AISC were pressured higher due to declining prices of by-product commodities like copper and silver. On the other hand, lower oil prices and weakening currencies vis-a-vis the $US-denominated spot price are lowering relative input costs. If you think spot gold won’t persist below AISC, the miners are IMO a screaming buy here. If you think spot gold with persist below – potentially well below – the AISC over the medium term, tread carefully. A lot of the miners have highly leveraged balance sheets and could be looking at bankruptcy under those conditions. If the cost of getting the gold out of the ground is considerably less than the value of the gold you get out, then a gold mining stock can be considered a share in a pile of physical gold. But when the price of gold get to close to the cost of recovery, then a share in the gold miner stock is a lot more like a leveraged bet on the future price of gold. If the price goes up the company will make a lot of money if it goes down they may not make any money. It would be interesting to see how much the ratio between total cost of recovery (price of claims, labor and operations) vs price of gold has changed over time. That might give us some idea of whether the miners are a better investment. The trend in the ratio seems to show that investors desiring the “security” of gold have a strong preference for the shiny metal than for shares in mining operations that generate unpredictable cash flows. At some point, the mining shares will become unreasonably cheap and a few people will, quite visibly, make a bunch of money. Before that happens, a lot of people will lose varying amounts of money and nobody will hear from them. As Barry said, good luck determining what price is too cheap. “Cheap” only matters when the rest of the market agrees with you. Barry, how much of one’s investment portfolio should be dedicated to the Black Swans? Given there is no question that they exist, and that they shall return, though I agree that their comings and goings do not follow any popular narrative or even any coherent one. Nor do I think the answer to this question should depend upon one’s estimation of what the probability is in any given period that a Black Swan will return. Once upon a time the gold miners and gold could have value based on the “fundamentals”. That is; the price of gold was sufficiently more than the cost of gold and a well run gold mining business could leverage earnings as the price of gold increased. Somehow the smartest guys in the room decided to add debt to expand mining operations and pay themselves big bonuses along the way. Then the gold bugs who are little more than delusional narcissists convinced everyone that the end of the world was near and the only way to repent was at the alter of gold. Even Glen Beck convinced his followers that their just rewards were only months away as gold was going to pass $2500 per ounce in the near future. Something went wrong with the plan and the gold bugs preached to their following “have faith eventually I will be right” and don’t be like those heathens who like the stock market and the US$ which has lost 98% of its value since 1913. Coincidentally that was the year the Federal Reserve was formed as the devil that would destroy all things economic except gold of course. Enough you say but what about the gold manipulators and the evildoers of the Obama administration and too much regulation and the liberal media? What does the Elliott wave theory say and how about China India and Russia buying all of the worlds production for the next 100 years? WHAT HAPPENED? Look at the price oaction of your favorite gold mining stock. No explanation needed. It’s 1985 all over again. In a portfolio, gold and commodities at 5%-12% are a pretty good bet. If you don’t get mean variance optimization, you don’t get mean variance optimization. Where has the $30B in physical gold that has been removed from GLD in the past 30 months gone, and why?